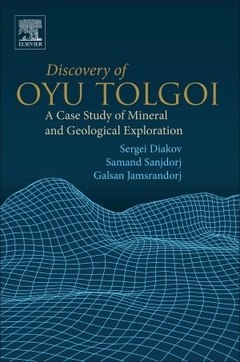 Discovery of Oyu Tolgoi: A Case Study of Mineral and Geological Exploration is a detailed account of the exploration for copper deposits in Mongolia that was started in mid-90s by Magma Copper and then continued by BHP Billiton World Exploration Inc., which consequently lead to the discovery of Oyu Tolgoi, a major metal mine. In November 2017 Oyu Tolgoi celebrated its 20th anniversary of its discovery. This book commemorates this historical event for the global mining industry. The book includes details for various exploration methods and tools applied by the exploration team throughout the discovery. The models applied by the explorers also evolved over the course of execution of their exploration program, as did the knowledge in the team for regional geology and understanding of necessary geological conditions for a significant porphyry discovery. Graduate of the Russian Peoples' Friendship University, PhD, Associate Professor. In the position of Central Asia Exploration Manager of BHP Billiton he supervised the company prospecting and mineral exploration programs in Asia (Mongolia, China, Kazakhstan, the Philippines, etc.). Expert in porphyry copper, gold, uranium and copper-nickel deposits with more than 25 years of experience in the mining industry. Working at global leading mining companies he led to a discovery of new mineral deposits in Asia and South America. Graduate of the Irkutsk Polytechnic Institute 1973, Sanjdorj worked in the mining industry of Mongolia for more than 40 years. Participated in the search and exploration of ground water resources across Mongolia. He was supervising water exploration, environment protection and geology. Sanjdorj is Emeritus Vice President of the Oyu Tolgoi Company. He has been awarded a title of Honorary Worker of the Industry of Mongolia. He is currently a Consultant for the company. A graduate of the Irkutsk Polytechnic Institute 1975, Jamsrandorj started his career in the Darkhan geological expedition of Mongolia. He is an expert in gold and uranium exploration. Jamsrandorj is a discoverer of gold placer deposits Buhlei and Zaamar. Jamsrandorj has more than 40 years of experience working in various management positions in the scientific and industrial exploration industry of Mongolia.